Routine preventive care helps your veterinarian establish normal baseline laboratory values when your feline friend is young and healthy. Even subtle changes from baseline values can help identify disease as your cat ages, long before they become apparent to you or your veterinarian. Preventive care for your senior cat helps to detect disease in its early stages when it is most likely to respond to treatment. It can also help you avoid significant medical expense and risk to your pet’s health. The goal of every veterinarian is to identify any problems your cat may have early on. Sometimes, early detection can mean better treatment options or possibly slowing the progression of a disease. It is incredible what we can learn about your cat’s health with tests conducted on samples of blood and urine. Fairview Animal Hospital is fortunate to evaluate blood and urine in-house for immediate results on the most common blood profiles for your cat. Also, we can obtain results on a wide variety of tests through our partnership with Idexx laboratories. How do I interpret my cat’s blood test results? Our veterinary team at Fairview Animal Hospital will interpret your cat’s blood results and can discuss these with you in detail in person, over the phone or via email. Blood testing is important for your cat’s health. Routine blood testing can alert your veterinarian to changes in certain parameters. These values may indicate the beginning of a disease process or a current illness or deficiency that your animals may develop. Early diagnosis is critical for preventing disease progression, and to deliver the best outcome for treatment in many cases. It will increase the quality and longevity of your cat’s life. Blood tests when your cat is symptomatic or ill can provide your veterinarian with lots of information regarding what is going on inside your pet’s body, at a physiological level. It will also help them diagnose your pet and deliver an educated treatment plan to help your cat on the road to recovery. Blood tests can also be important if your kitty is taking medication for various reasons. Some medications need to be dosed accordingly, some medications can cause changes in certain blood values; routine blood testing also allows our veterinarians to monitor any adjustments required in regards to your pet’s medication. Fairview Animal Hospital is equipped to run many blood tests in our clinic laboratory – this, yields same-day results reported to you by your veterinarian. Certain tests are completed at our out-sourced laboratory partner, Idexx. These results can vary depending on the specific test, laboratory load, day of the week etc. Our veterinary team will ensure that results are reported to you as soon as possible, often within 7-10 business days. Fairview Animal Hospital strives to make blood testing as stress and pain-free as possible. Felines often become stressed in their carrier and a clinic setting, trying to prevent this will allow your cat, you, and our veterinary team to be happier. Calming pheromones, low-stress handling, and rewards can help your cat have a better visit to our clinic. We would love to help you find ways to decrease stress for your pet. Don’t hesitate to call or email our clinic. We would be happy to help suggest some tips and tricks for getting your feline friend to our clinic with as little stress as possible. 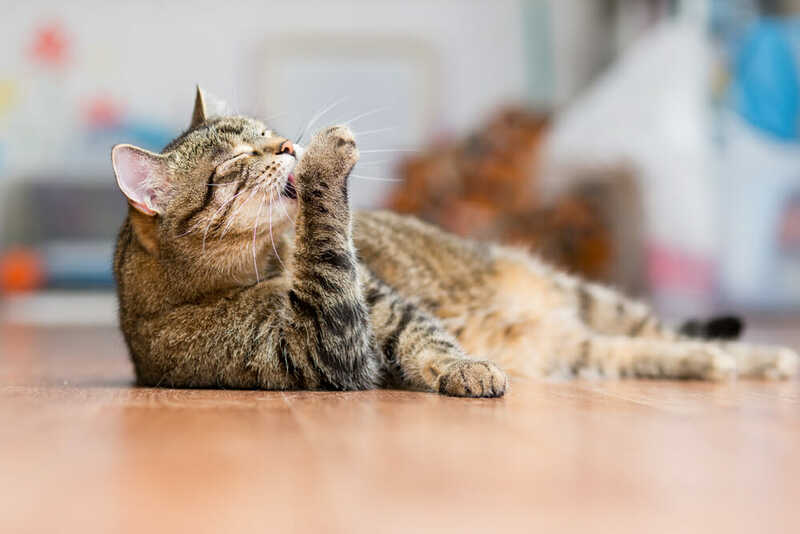 Our team of veterinarians, registered veterinary technicians, and veterinary assistants all work together to create a low-stress experience for your cat. It may involve feline pheromone spray, treats, food, petting, etc. If your feline friend is on the feisty side, your veterinarian can suggest and recommend options to ensure everyone, especially your pet, stays safe. Some blood testing may require special instructions, such as feeding, not feeding, giving medications, or not, and timing. Routine, general blood testing can usually be completed at any time of day. However, for some tests, your veterinary health team will make you aware of any specialized instructions before your appointment. If you have any questions or concerns, please contact us. Your veterinarian at the Fairview Animal Hospital can help you with a blood testing protocol that is tailored to your pet. Blood testing before surgery or sedation procedures is vital in detecting abnormalities that may impact the procedure. There is also a great benefit to annual blood testing and screening. It allows your veterinarian to compare values and detect changes even before they become apparent, or symptomatic. Other blood testing may be reserved for times when your pet is ill or if your veterinarian is concerned about specific disease processes. Your veterinary team will recommend the blood testing that best suits your pet’s age, health and lifestyle. Fairview Animal Hospitals veterinary team can complete urinalysis in our clinic laboratory, or, if required, our out-sourced laboratory partner, Idexx for specialized testing. We are also able to complete biopsies of various areas and specimens. Your veterinarian will recommend and help you decide if a biopsy is required, and come up with a plan to obtain the samples.